SuccessFactors recently added a lot of new features surround campaign pages and engaging more candidates. By utilizing these campaign pages, we can learn a lot more about our candidate pool by targeting these users and capturing more information from them. The best part about these pages are how easy they are to create. Content is easy to change out, images and videos easy to add and now with the new data capture forms, we can easily configure what data we want to capture. These Data Capture Forms allow us to capture more about a candidate, and capture more candidates interested in your company by targeting specific groups. 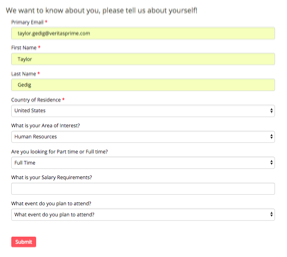 Using your social media accounts to drop the candidate on the landing page you would like, with a form to capture information you want to know. To start we will create fields we want to capture, put those fields into a Data Capture Form. We will then put that form on a landing page, and then market our page using social media accounts to capture more candidates. 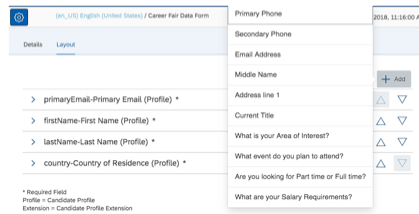 The Candidate Profile Extension will allow us to capture more fields on a candidate’s profile, and view use these fields when searching for candidates. Now that we have our Data Capture Form created, we can add this to a landing page. To create a landing page, select Add. Click on the component to edit text, font, and colors. Details will allow you to edit text, fonts and messages, styles will allow you to edit the color scheme and DPCS will allow you to the colors and fonts used in the consent statement message. 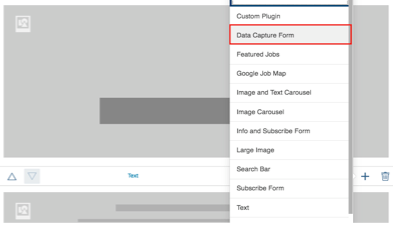 Once you have completed editing the component, select publish and then the preview option to preview your page and data capture form. Scroll down to Shorten URL, and generate a shorter URL. (Shorter URLs work better when sharing over social media) You also have the option to Generate a QR Code. When we select a Social Media Account to share it on, you will be prompted to login to your account, and the URL will prepopulate, leaving you with room to edit the details of the tweet or post. Once you Share the URL on your social media accounts, you will start seeing activity on the landing page. As you continue to market this page you will receive more and more candidates. As you candidate pool gets bigger, we need to start managing the talent within our system. I will cover finding and managing candidates with talent pools in my next blog. After we organize our talent, we will want to start engaging and targeting those talent pools. We will cover this in my last CRM blog, utilizing the new email campaign feature. Using these new Successfactors features will make placing the candidate in the right position that much easier by targeting your candidates pool and you talent. Hi Taylor……. Nice article, worth to read.